Cottage Bouquet is a unique, one of a kind painting by Melanie Pruitt. Painted with a very spontaneous style, I started with a blank paper and I randomly dropped scrunched kleenex onto the paper and drew around these shapes. These were the areas I that would be my whites. Then I wetted the whole sheet and laid in a background of pink, yellow and blue. I used some pressed flowers scattered in the wet paint for texture, painting the backs of some before laying them on. I also threw salt on a couple of areas. When it was dry, I removed the salt and flowers and began looking for shapes. I began to sketch out the flower and leaf shapes I saw, and then did a lot of negative painting to darken the corners and bring out the flowers. I also added many layers to the flowers to give them depth. This spontaneous attempt at painting is brand new for me! 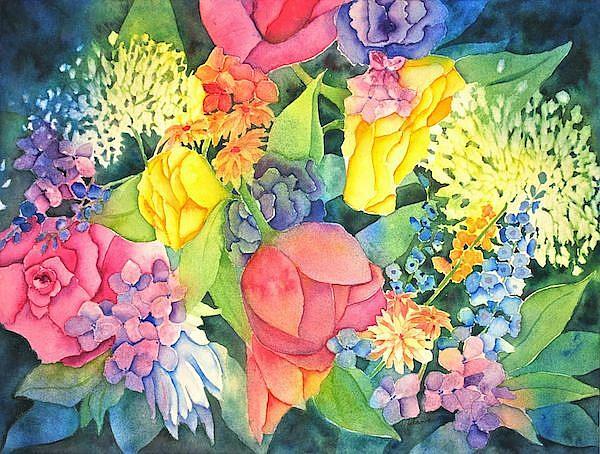 This watercolor painting has multiple layers of transparent watercolor washes and colors, and yet, it was painted with only 3 colors of transparent watercolor paint (Daniel Smith Rhodonite, Colbalt, New Gambooge) blended and mixed to create such a vivid cottage garden bouquet!